When the oil from the tanker Prestige began washing up along Spains northwestern coast last November, it wasnt the kind that leaves a slippery, thin sheen on everything it touches. This was heavy, refined oil. You could pick it up with a pitch fork, says oceanographer Ed Levine of the U.S. National Oceanic and Atmospheric Administration (NOAA). And unlike other spills, such as the Exxon Valdez for example, the Prestige spill didnt happen in just one day. Its still leaking, and has been leaking for months, Levine says. With regional elections coming up in May, the continuing disaster of the Prestige has the Spanish government on the defensive. In response to this spill, both the Spanish and French governments have declared a unilateral ban on single-hulled tankers in their waters. But the Spanish governments decision to move the Bahamas-registered, Liberian-owned and Russian-chartered Prestige away from shore has resulted in outrage from the Spanish community. The scientists represented 32 universities and six research institutions. In their letter, they accused the Spanish government of failing to obtain scientific input before moving the Prestige out to sea. The dominant winter winds in the region are west-southwesterly and the ocean currents run south to north up the coastal slope, they wrote. 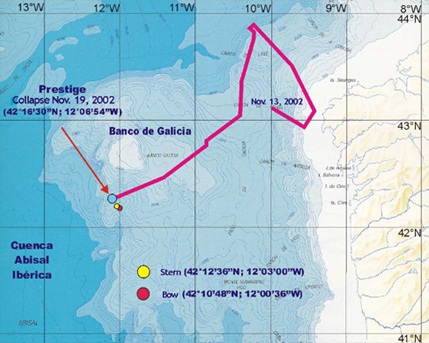 The decision to move the vessel offshore, from about 43 degrees North latitude and 9.5 degrees West longitude, to the southwest was a consequence of poor communication between government officials dealing with the spill and the scientific and technical communities, rather than a deficit of knowledge, they wrote. Instead of confining the oil spill close to the coast of Galicia, by moving the vessel further out to sea the government enabled the oil spill to spread from Portugal to France, the scientists contend. Indeed, the oil has spread over more than 900 kilometers of the European shoreline, causing an estimated $1 billion in cleanup costs. The government also now faces lawsuits from ecologists and activists in the lobbying group Nunca Mais, formed after the Prestige oil spill to Never Again experience a similar disaster. On Feb. 23, hundreds of thousands of protesters marched through the streets of Madrid to demonstrate against the governments handling of the situation. Beginning in December, three teams of scientists from NOAA traveled to Spain for two weeks each to help with the immediate cleanup efforts and provide advice for managing the years of cleanup to come. In turn, the American scientists gained insight in dealing with a very different type of oil spill than what they have seen in the past. There was so much and it kept coming in waves. In terms of planning, it wasnt lets clean this beach tomorrow and go someplace else after that, Levine says. Because new oil would arrive, we were cleaning one beach for days and weeks. NOAA has been following the long term impact of the Exxon Valdez spill for 14 years, and found that although the Prestige went down with almost twice the amount of oil spilled by the Valdez, in Spain the cleanup will be able to proceed year-round verses the spring and summer window of opportunity for cleanup in Alaska. This time advantage will be important in pursuing cleanup plans as the oil the Prestige spilled is much heavier and more persistent than the crude oil that the Valdez spilled. The disaster began when the Prestige sent a mayday call to the Spanish coastguard on Nov. 13. High seas and heavy winds left the 26-year-old ship with a 9- to 15-meter crack in the middle of its single hull and listing at a 45-degree angle. By the end of the day, the crack had leaked a pool of oil around the ship a mile wide. Its engines off, the Prestige drifted east within 5 kilometers of the coastline, according to reports. The next morning residents of Muxia awoke to the sight of the listing tanker offshore. It was a horrifying scene. We went to bed thinking the boat was 22 miles [37 kilometers] offshore and there it was right off our beach. Everybody was terrified, Ramón Perez Barrientos, head of civil defense in the fishing village, told The Wall Street Journal. After an all-night struggle, tugboats secured the tanker on Nov. 14 and a helicopter check of the vessel indicated its precarious physical condition. Jose Luis Lobez Sors, director general of Spains merchant marine service, gave the first order to tow the vessel out to sea. By the time the Dutch salvage company SMIT, which received the contract to rescue the vessel and its cargo, had a chance to board and investigate the Prestige, it was 2 a.m. on the morning of Nov. 15. The tugboats had towed the leaky Prestige back out to sea about 40 kilometers. SMIT deputy chief executive, Geert Koffeman, met with Spanish government officials to discuss changing the direction of the vessel and bringing it into La Coruña Bay to attempt salvaging the oil. He failed, however, to convince the government leaders to change their plans. The Prestige broke in half and sank on Nov. 19. About 4,000 metric tons of oil escaped before the ship went down about 200 kilometers west of Spain. The two sections came to rest some 3,500 meters apart with about 73,000 tons of oil still leaking at a rate of 125 tons a day. As of March 13, Half of the oil is still there, at 3,200 meters depth. Just a time bomb, says Enrique Alvarez Fanjul, marine environment department head for the Ports of the State in the Ministry of Public Works and the Economy. This is not the first time authorities in the region have seen an oil spill on their beaches. In December 1992, the Aegean Sea tanker crashed on the rocks beneath the Torre de Hercules lighthouse, contaminating La Coruña beaches with almost 80,000 tons of crude oil. In the state of Galacia, the fishing industry struggled for years to recover. Spains Minister for Internal Development Francisco Alvarez Cascos is reported to have authorized the decision to keep the Prestige away from the coast after consulting with civil servants from La Coruña and Galicia. After the ship broke and as it began sinking, the Spanish authorities contacted the U.S. Naval Research Laboratory (NRL) at Stennis Space Center in Mississippi to help them with monitoring the ocean currents and determining what direction the oil would travel. We had models up and running within four hours of agreeing to provide help to the Spanish government, says Capt. Robert Garrett, military deputy of NRL. Looking at the situation in retrospect, Garrett is sympathetic to the Spanish governments decision to try and keep the tanker as far from the coast as possible. Somebody would question their sanity no matter what they did, he says. On Dec. 9, Spains equivalent of the National Academy of Sciences formed a scientific committee to decide about the fate of the remaining oil in the wreck while France began patching leaks in the tanker using its mini-submersible Nautile. A second committee would address the cleanup, restoration and additional matters regarding the spill. In January, the Nautile succeeded in slowing the leakage rate from 125 tons a day to about 80 tons a day. And as of mid-March, all of the remaining holes had patches although only half of the original 77,000 tons of oil remained in the vessel. The patches are expected to hold for a year, giving Spain a rough deadline for either removing or encasing Prestiges remaining cargo. After four months of laboriously scooping oil, the thousands of volunteers working with the Spanish Army have a clean slate of sandy beaches, but are still struggling to clean the hard-to-reach rocky shores and reefs. And from time to time there is a new wave coming ashore, especially in the north coast of Spain, Fanjul says. A huge amount of fuel was injected into the Bay of Biscay circulation and from time to time it appears somewhere in the North. If it is located on time it is followed and forecasted, thanks to NRL data and other inputs. During the International Oil Spill Conference in Vancouver, B.C., from April 6 to 10, scientists and government officials are expected to discuss the next phase in the cleanup of Spains black tide.